A year ago today at 11:52 AM, we welcomed our son Andrew Glenn into the world. We instantly nicknamed him Andy. A beautiful baby boy with thick brown hair and the bluest of eyes, he was everything to us – a dream come true. But, our dreams were painfully shattered when we discovered that our perfect baby had a fatal neuromuscular disease called spinal muscular atrophy or SMA. We lost Andy to this devastating disease in June, just four days shy of his five-month birthday. Now we find ourselves, seven months later, facing his first birthday without him. Knowing how he loved a party, we will come together to remember him. But unlike other parties for typical one-year olds, today we will gather around his final resting place and wonder how it came to be that we are celebrating what should be such a happy day in a graveyard. How in a year we could experience both the miraculous moment when he came screaming into this world and the crushing sadness of watching him take his final breath. How our lives could be so completely and forever changed. Andy taught us so much through both his life and death, but, most of all, he taught us to be grateful. For each moment we have together. For every unhindered breath we take. For the love and kindness that surrounds us. For the hope that keeps us going. In his honor and memory, we want to let you – our friends and family – know how much we have appreciated the support and compassion you have shown us this year. You surrounded us with love in our time of despair. You gathered together as “Andy’s Army,” giving your time and money so selflessly to help us as we strive for a cure. You sent us cards, letters, and e-mails even when you didn’t have the words to console us. You called just to let us know that you were thinking of us. You listened to us and allowed us to cry. And you understood when we didn’t know how to show our gratitude. These two simple words seem so inadequate for all of your kindnesses, but we thank you from the bottom of our hearts. We thank you for keeping our precious son alive in your memories. 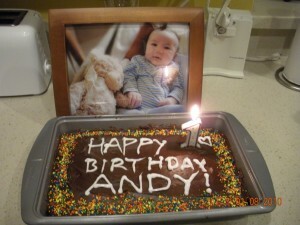 Our present to Andy on his first birthday is our commitment to keep celebrating his life. While we always will remember 2009 as Andy’s year, we will not forget the lessons he taught us or the bravery he showed us in his fight against SMA as we move into the future. Andy always will be a part of our family, and his legacy will live on through all of us. Today and always, we will remain forever grateful for you and for the little angel who is watching over us all in heaven.